The incredibly kind people over at The Harvard Common Press must have known I was on a self imposed cookbook purchasing hiatus because they offered to send me four cookbooks, all part of the “Baker’s Field Guide” series. They even have a pull quote from David Lebovitz on the covers. I was sold. Side note: I’ll be giving away a set of these cookbooks soon, so stay tuned for a chance to win! One of the books was all chocolate chip cookie recipes, and my eyes immediately went to the “half and half cookies,” perfect for those of us who have trouble making up our minds when it comes to cookie flavors! The cookie is half chocolate chip, half rich chocolate with white chocolate chips and is chewy and absolutely delicious. My coworkers ate them up in no time, and everyone keep saying how good they are. They’re definitely worth the extra time it took to roll all the dough balls. Whisk 2 cups of the flour, the baking soda, and salt together in a medium-size bowl. In a large bowl with an electric mixer on medium-high speed, beat butter until creamy, about 2 minutes. Add granulated sugar and brown sugar gradually, beating until light and fluffy, about 3 minutes, and scraping down bowl once or twice. Beat in vanilla, then eggs, one at a time, scraping down bowl. Add about one-third of flour mixture and mix on low speed. Gradually add remaining flour mixture, mixing just until blended. Divide mixture in half. To one half, beat in remaining 3 tablespoons flour and the semisweet chocolate morsels. To the other half, beat in sifted cocoa and white chocolate morsels. Cover with plastic wrap and chill doughs separately at least 2 hours or overnight. Press the balls together, side by side, so you can see both colored doughs. Gently form this cookie into a ball. Place on prepared cookie sheets 2 inches apart so that doughs remain side by side. Bake until edges and tops just begin to turn light golden brown, about 12 minutes. Place sheets on racks to cool for 5 minutes, then remove cookies from sheets and place directly on racks to cool completely. 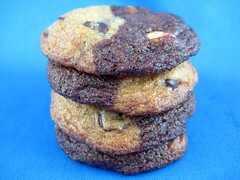 Recipe from A Baker’s Field Guide to Chocolate Chip Cookies by Dede Wilson. Those look delicious! I love HCP. They come out with some lovely things. Those look great. I used to have a small cookbook that was all chocolate chips cookies but it’s gone. I think I gave it away! That was before my cookbook obsession, obviously. I just moved and had to pack and unpack all my cookbooks so I am with you on the cookbook hiatus. It wasn’t so bad when I had a separate room for them but now that I have to keep them out in the open, I am shamed into getting a grip on my habit. I’ve seen cookies like this at restaurants before and have been meaning to make some. I love the idea! Yin and Yang cookies!! Love it! These look good. Did you eat down the middle or one side first? This looks awesome. Though I’d probably use something other than white chocolate chips. I love them, but most of my friends seem to believe that white chocolate is the devil. Silly, but they’ll eat it with butterscotch chips and then I won’t have to eat them all.